The Santa run will take place on the same 5km and 10km course as the regular trail run, starting at 10:00 Santa suits are an optional extra to purchase at the time of registration at a cost of £4-£5 per suit, feel free to bring your own if you are already kitted out! 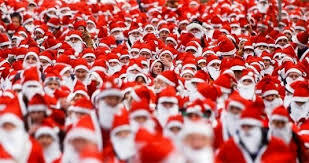 There is also a kids Santa Run over the 500m course starting at 09:45. Suits will be available to collect on race day only and are a one size fits all design with trousers, top, beard and hat. They are yours to keep at the end of the event!